Lionheart hatched in captivity and was brought to Richmond Hill on July 6, 2001. After 17 days in the hack box on the roof of the Richmond Hill Town Hall, Lionheart was released at 43 days of age and took flight without hesitation. He was recaptured in mid-August and fitted with a 20-gram satellite transmitter, making him the fifth peregrine falcon from Richmond Hill to be followed through Project Track-'em. Reports from his transmitter are summarized in the maps below and the accompanying "Traveler's Diary". December 10, 2002: Guelph - Ontario Veterinary College. In late November, Lionheart was discovered on the ground on the east side of Hamilton Harbour, and brought to the Ontario Veterinary College for treatment. He was diagnosed with a broken wing, and has since undergone successful surgery. Tests showed that he had a fairly high level of lead in his blood, and thus a chelation treatment was started to remove some of it from his system. Prospects for a full recovery look good at this point, and we will post further news as we receive it. July 16, 2002: Hamilton Harbour. Roughly five weeks after confirming Lionheart's presence at Hamilton Harbour, Brandon and Eric Holden spotted a peregrine with transmitter there this morning which very likely was again Lionheart. Around 7:30 am, they spotted the peregrine hunting pigeons under the bridge; ninety minutes later he was still present. While a black leg band was visible, he was not quite close enough for the characters to be discernible even with a scope, but chances are very good that it was in fact Lionheart. July 9, 2002: location unknown. Four weeks have passed since the last signal from Lionheart's transmitter, and it is probably safe to assume that the battery powering it has now failed. There have not been any confirmed sightings of Lionheart during this period either, though a couple of reports from the Oakville area might have involved him, given that in early June he was spotted just to the west in Burlington. June 11, 2002: 43.7N, 79.2W (Scarborough, Ontario). Surprisingly, Lionheart's transmitter was active again today. Though weak, the signal suggested he was again in the Scarborough Bluffs area, close to where he was back on June 2. Odd, given his appearance at Hamilton Harbour just two days ago, but certainly possible given the relatively short distances involved. June 9, 2002: Hamilton Harbour. Exciting news this morning - a confirmed sighting of Lionheart! I received an e-mail this morning from Eric and Brandon Holden, who reported that they had observed a peregrine with a transmitter earlier today at the lift bridge at the mouth of Hamilton Harbour. Using their scope, they were able to read the band number, which I have confirmed is Lionheart's. Brandon also noted that "the bird looked to be in good health, and we even watched it chase down a starling with ease". This is the first confirmed sighting we have had of Lionheart in over a month, and the first time we've known his location in a week. Considering that seven days ago he was in the east end of Toronto, it is apparent that Lionheart has not yet settled down and is still in search of a territory and/or a mate. Today's report was very valuable in helping us continue to track his movements, and we look forward to other similar observations as Lionheart wanders around the province. Sightings are always welcome at marcel@peregrine-foundation.ca. June 2, 2002: 43.7N, 79.2W (Scarborough, Ontario). After more than a month of silence, Lionheart's transmitter surprised us with a signal today. He is still in the Toronto area, but has moved east into Scarborough now. The signal from this afternoon placed him along the Scarborough Bluffs near East Point Park, an area where peregrines have been spotted periodically in the past. May 25, 2002: location unknown. Though we still have no recent locations reported to us from Lionheart, there was a weak blip from his transmitter today suggesting that we shouldn't yet give up hope completely of receiving another report. In the meantime though we are still hoping to receive word of him being sighted somewhere. May 9, 2002: location unknown. More than ten days have passed since we last heard from Lionheart. On May 5 there were two weak pulses from his transmitter, but not enough for the satellite to interpret a location. He may still be in Mississauga, but we have not heard from sightings of him there recently either. As before, we encourage anyone seeing a peregrine wearing a backpack antenna to contact us at marcel@peregrine-foundation.ca to help us determine where Lionheart may currently be. Apr 28, 2002: 43.5N, 79.6W (Mississauga, Ontario). Tonight one clear signal came through from Lionheart, and it indicates that he is again in Mississauga, near the St. Lawrence Cement plant. This suggests that the distant reports received on April 23 were likely artifacts of a fading battery in his transmitter. Apr 23, 2002: 41.4N, 73.4W (Danbury, Connecticut) OR 43.8N, 84.6W (northwest of Saginaw, Michigan). Less than a week after we received a set of very ambiguous data from Lightning, the same situation has arisen with Lionheart. In his case, the two alternate locations are roughly 1000 kilometres apart, and each is more than 400 kilometres from his previous location in Mississauga. Is he actually in Connecticut or Michigan, or is this data the result of a battery approaching the end of its lifespan? Hopefully we will get some answers with our next report four or five days from now. Apr 19, 2002: 43.5N, 79.6W (Mississauga, Ontario). Again the signal from Lionheart's transmitter was weak, but confirmed that he is still in southwestern Mississauga, near the Lake Ontario shoreline. Apr 14, 2002: 43.5N, 79.5W (Mississauga, Ontario). As suspected, Lionheart is in Mississauga. The location given by his transmitter tonight was not very accurate, but it does place him in southwest Mississauga, and suggests that he may well still be at the St. Lawrence Cement plant. Apr 13, 2002: location unknown (Mississauga, Ontario?). Over the past couple of days there have been reports of a juvenile peregrine wearing a satellite transmitter, perched on the St. Lawrence Cement plant in Mississauga. Since Lightning remains further south, and we have not heard from Trillium or Dieppe in several months, it seems likely that this is Lionheart. However, since his transmitter is also silent at the moment, we cannot be sure until his leg bands are seen. Hopefully he will remain in the area; we ask everyone in Mississauga and Oakville to keep an eye out for him and let us know if he is spotted. Apr 10, 2002: location unknown (Richmond Hill, Ontario?). Since Lionheart returned home, his transmitter has not given us any further clear signals. While he may remain in Richmond Hill, we can't be certain. If anyone happens to see a peregrine wearing a transmitter, please e-mail us your observations. Hopefully we will soon hear from his transmitter again too, but the more reports we can get about him, the better. Apr 1, 2002: 43.8N, 79.5W (Richmond Hill, Ontario). HOME SWEET HOME! After a journey of less than two weeks, Lionheart has returned from his winter home in South Carolina to Richmond Hill, where he was released last July. Today's satellite readings weren't the most accurate, but it appears that he may be only a couple of kilometres west of the Richmond Hill Town Hall where he was raised. It's possible that Lionheart is the juvenile peregrine with a transmitter spotted near Yonge and Bloor in Toronto yesterday. Mar 28, 2002: 38.7N, 79.3W (Franklin, West Virginia). Lionheart's recent restlessness was not a fluke - he's heading home (or at least heading north)! Tonight he's near Franklin, West Virginia. This is roughly 660 km north of his winter home in Charleston, and of significance, lies only barely to the side of a straight line connecting Charleston and Richmond Hill. We will probably know within the next week or two whether Lionheart returns to Richmond Hill, but at any rate it looks like he is aiming in that direction. Mar 23, 2002: location unknown. The signal from Lionheart's transmitter today was very weak, and the satellites were unable to resolve his position. Hopefully the next report in four or five days will be better. Mar 18, 2002: 33.2N, 80.7W (Reevesville, South Carolina). Is Lionheart heading home? Aside from his one offshore venture in early January, this is the first time in nearly four months that Lionheart has been recorded outside of Charleston. His location today was Reevesville, a small town roughly 60 kilometres northwest of Charleston. It will be very interesting to see whether he continues heading north when we receive his next signal on March 22 or 23. Mar 14, 2002: 32.8N, 80.0W (Charleston, South Carolina). Again Lionheart is near Charleston, slightly inland from the coast. Mar 9, 2002: 32.8N, 79.9W (Charleston, South Carolina). Lionheart is back to where he was a few weeks ago, on the west side of North Charleston. Mar 1, 2002: 33.0N, 80.0W (Charleston, South Carolina). Bit by bit, Lionheart is inching north, another indication that he might be thinking about migrating back north soon. Feb 24, 2002: 32.9N, 80.0W (Charleston, South Carolina). Lionheart has flown inland a bit further today, but remains in Charleston. Feb 22, 2002: 32.9N, 79.8W (Charleston, South Carolina). Again Lionheart has moved a bit, this time slightly to the northeast of Charleston. Over the past week he has been noticeably more restless than in the previous couple of months, perhaps an indication that he notices spring is on the way and is considering heading back north soon. Feb 17, 2002: 32.8N, 79.9W (North Charleston, South Carolina). For the first time in a while, Lionheart has moved a bit. Today he is about 20 km inland, on the west side of North Charleston. Feb 13, 2002: 32.8N, 79.9W (Charleston, South Carolina). Lionheart is on the coast near Charleston again tonight. Feb 9, 2002: 32.8N, 79.9W (Charleston, South Carolina). Another report from Lionheart places him in Charleston yet again. Feb 4, 2002: 32.8N, 79.9W (Charleston, South Carolina). Lionheart is closing in on two and a half months in Charleston. Jan 30, 2002: 32.8N, 79.9W (Charleston, South Carolina). Again, Lionheart is in the Charleston area, this time right along the coast. Jan 25, 2002: 32.8N, 80.0W (Charleston, South Carolina). Lionheart remains in Charleston. Jan 22, 2002: 32.8N, 79.9W (Charleston, South Carolina). A strong signal from Lionheart today confirmed that he is still in Charleston. Jan 18, 2002: 32.8N, 80.0W (Charleston, South Carolina). Lionheart has returned to his usual location in Charleston. Jan 14, 2002: 32.9N, 80.0W (Charleston, South Carolina). To our relief, the latest report from Lionheart indicates that he is back over land again, this time on the north side of Charleston. Whether the January 10 report was simply an aberration, or Lionheart was actually out over the Atlantic is unclear, but perhaps his activities in the coming weeks will provide some more clues about his behaviour. Jan 10, 2002: 32.6N, 79.2W (offshore east of Charleston, South Carolina). Do we have a seafaring peregrine in Lionheart? Today's signal was of reasonably good quality, yet indicated that he was more than 50 kilometres east of Charleston, i.e. out in the Atlantic. There may be small islands offshore that I'm unaware of from the maps I've checked today, but more likely he is taking a ride on a ship of some sort, as other peregrines have been known to do in the past (or else there may have simply been some disruption of signals today, as Nate's location was also a bit peculiar). Jan 5, 2002: 32.7N, 80.2W (Charleston, South Carolina). Today's coordinates put Lionheart further inland for a change, however, the quality of the transmission was poor and it may be that in reality he remains in the same area as usual. Jan 1, 2002: 32.8N, 79.9W (Charleston, South Carolina). As has become expected, Lionheart remains along the coastline in Charleston. Dec 27, 2001: 32.8N, 80.0W (Charleston, South Carolina). Lionheart has now spent a full month in Charleston, and it seems likely that this is where he will remain for the rest of the winter. Dec 23, 2001: 32.8N, 79.9W (Charleston, South Carolina). Once again Lionheart is reporting from Charleston; his location tonight appeared to be from along the city's harbourfront area. Dec 19, 2001: 32.8N, 80.0W (Charleston, South Carolina). Lionheart remains in the same area of Charleston. Dec 14, 2001: 32.8N, 80.0W (Charleston, South Carolina). Once again, Lionheart has resumed communication with us after a brief period of silence. He has not moved much since we last heard from him, and after close to three weeks in Charleston, it seems safe to assume that he has chosen to stay there for the winter. Dec 12, 2001: location unknown. Lionheart's transmitter has been silent over the past week, but we have gone through this with his unit before and it resumed broadcasting normally, so we hope this will be the case again. Dec 5, 2001: 32.9N, 79.9W (Charleston, South Carolina). Lionheart remains in Charleston, slightly to the northeast of his last position. Dec 1, 2001: 32.8N, 80.0W (Charleston, South Carolina). A second consecutive report from Charleston suggests that Lionheart may have decided this is as far as he plans to go this fall. Nov 26, 2001: 32.8N, 79.9W (Charleston, South Carolina). An unusual turn of events - Lionheart has reversed course and headed back north since his last report. Perhaps he has decided he prefers North Carolina after all! Tonight finds him right in downtown Charleston. Nov 22, 2001: 31.6N, 81.9W (Jesup, Georgia). It looks like Lionheart isn't quite finished traveling yet after all. This evening a crystal-clear report came in from him, indicating that he's now near Jesup, Georgia, roughly 50 km southwest of Savannah. Nov 18, 2001: 34.4N, 77.8W (Wilmington, North Carolina). Some additional reports from Lionheart's current broadcast cycle indicate that he has moved closer to the coast and is now just outside Wilmington, North Carolina. Nov 17, 2001: 34.8N, 78.0W (Magnolia, North Carolina). After waiting to hear from Lionheart for another four days, it's somewhat surprising to see that he hasn't covered more ground in this time. He remains in North Carolina, though he has moved quite a bit to the southeast, and is now located midway between Fayetteville and Wilmington. Nov 13, 2001: 35.8N, 81.3W (Hickory, North Carolina). Lionheart has moved southwest within North Carolina toward Charlotte, and is now near the town of Hickory. Nov 8, 2001: 36.1N, 80.2W (Winston-Salem, North Carolina). After leaving us guessing as to his location for close to two weeks, Lionheart has surprised us by communicating from North Carolina! His behaviour to date had suggested he might hang around the Toronto area for the winter like Rouge did following the 1999 release in Richmond Hill. However, it appears that Lionheart has in the end decided to undertake a migration after all. As of tonight he is on the outskirts of Winston-Salem, North Carolina - roughly 850 kilometres due south of Toronto. Based on what we have observed with other peregrines, he likely began his journey 3-7 days ago; if we are able to retrieve the missing data from November 4 we may be able to refine this estimate. Oct 30, 2001: location unknown. Today's readings from Lionheart were all of very poor quality, and a location could not be identified from them. We hope that his next report will be better. Oct 26, 2001: 43.7N, 79.5W (Etobicoke). Lionheart has once again passed near the territory of Marco and Angel in Etobicoke, with reports coming in from the area of Royal York and Bloor, only a couple of kilometres east of the nest site. With both Etobicoke adults still on territory, it's unlikely Lionheart will stay in this area for long, as he is not likely to receive a warm welcome from them. Oct 22, 2001: 43.8N, 79.4W (Richmond Hill). While his brother finally began his migration yesterday, Lionheart has not (yet?) followed suit. He remains close to the Richmond Hall Town Hill as of today. Oct 17, 2001: 43.8N, 79.4W (Richmond Hill). Once again, Lionheart has returned to the comforts of home at the Richmond Hill Town Hall. What's more, by coincidence we received a report from Lightning just twenty minutes later, placing him at the same location, so it would seem that the two brothers are still hanging out together at least some of the time. Oct 13, 2001: 43.7N, 79.5W (Etobicoke). Lionheart is continuing to wander, shifting southwest a bit today to the area along the Humber River near Albion Road in Etobicoke. Oct 8, 2001: 43.8N, 79.4W (Richmond Hill). Whatever thoughts Lionheart had of heading off to explore new frontiers have been shelved, at least for the time being. Around 6 pm today, we received a crystal clear signal coming from him from the Richmond Hill Town Hall! While it's possible that he has been here on days that we received no transmissions from him, this is the first confirmation we've had of Lionheart at the release site in nearly a full month. Oct 4, 2001: 43.9N, 78.6W (Newcastle). Having explored the area west of Toronto a few days ago, Lionheart has now reversed his direction to pass through some of the communities east of the city. His first report today came from near Utica, Ontario, and he then moved southeast through Columbus, eventually ending up in Newcastle. While Lionheart hasn't yet shown much consistency in his movements, his restlessness is a good indicator that a more serious migration may be in the near future for him. The severe cold front which has just moved into southern Ontario could be the trigger to convince him to head south - our next report on Oct 8 or 9 will reveal whether this is the case or not. Sep 30, 2001: 43.4N, 80.2W (Little Lake). Lionheart appears to be in the area of Little Lake, just south of Highway 401 midway between the Guelph and Kitchener exits. Is he on the way toward Lake Erie, and ultimately points further south? Sep 25, 2001: 43.6N, 79.4W (Toronto). It seems that Lionheart is becoming quite the wanderer. Today he chose to explore downtown Toronto, reporting to us from near the Toronto Humane Society, in the Queen / Don Valley Parkway area. Sep 21, 2001: 43.8N, 79.3W (North York). Lionheart is back closer to home again, though he hasn't quite gone all the way back to Richmond Hill. His current position is around the northeast corner of North York, near Victoria Park & Steeles. Sep 16, 2001: 43.6N, 79.6W (Etobicoke). It appears that Lionheart may have paid Marco and Angel a visit today! The most precise coordinates received from Lionheart placed him around Bloor and Highway 427, just a couple of kilometres west of the Etobicoke nest site. Knowing the phenomenal visual acuity of peregrines, it's very likely that one or both of the resident birds spotted Lionheart. 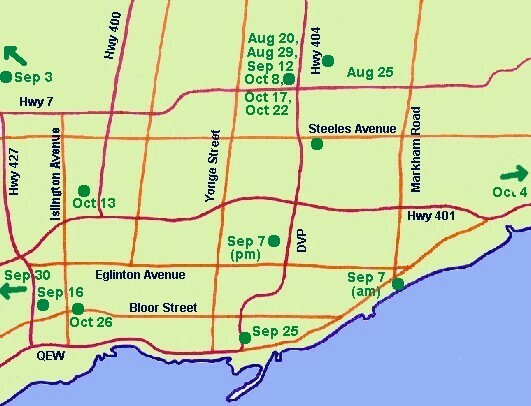 However, with the fall raptor migration underway and dozens if not hundreds of falcons and hawks passing by the Etobicoke territory daily, it's doubtful they would have been very interested in his presence unless he came really close to Islington and Bloor at some point in his travels. Sep 12, 2001: 43.8N, 79.4W (Richmond Hill). Lionheart has returned to home base at the Richmond Hill Town Hall. Sep 7, 2001: 43.7N, 79.4W (North York). Today Lionheart decided to spend some time south of his home base in Richmond Hill. He reported in at one point from the Scarborough Bluffs near Markham Road, but the clearest signal of the day came from around Don Mills & Lawrence in North York (an area which has hosted peregrine activity in past years, albeit only for brief periods). Sep 3, 2001: 43.7N, 79.8W (Brampton). It seems that Lionheart is becoming more adventurous. The first two reports from him today indicate that he was just southwest of Orangeville, roughly 50 km northwest of Richmond Hill. By the end of the six hour long broadcast period, he began heading back in the direction of home, and we received reports of him as far as downtown Brampton. Whether he stayed there or kept heading back east toward Richmond Hill we can only guess. Our next report expected around Sep 7 may give us some indication. Aug 29, 2001: 43.8N, 79.4W (Richmond Hill). Lionheart must have been perched practically right on the hack box for today's report! The signal was of the clearest possible quality, and pinpointed the location of the box with remarkable accuracy. Aug 25, 2001: 43.9N, 79.3W (Markham). Today Lionheart wandered a bit to the northeast, a bit past the Buttonville Airport. Lightning and Legacy are known to have frequented this area in recent weeks, so now it appears that all three of them make visits to this site. Aug 20, 2001: 43.8N, 79.4W (Richmond Hill). This afternoon, Lionheart became the second of this year's Richmond Hill peregrines (and the fifth overall) to join Project Track-'em. He has already been showing signs of independence recently, so it may not be long until we get some interesting reports from him away from Richmond Hill.